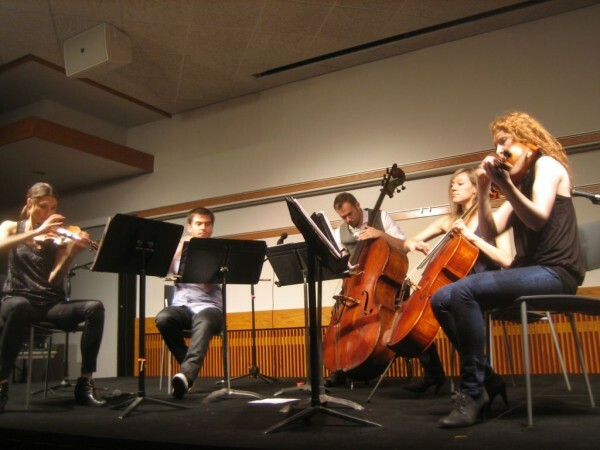 Violinists Sarah Whitney and Sami Merdinian, double bassist Louis Levitt, Cellist Laura Metcalf, and Violist Angela Pickett performing for students for an evening of dinner and music. Sybarite5 showed off their diversity in a concert at Salt Lake Community College on March 4, 2013. The group played to a sold out audience as part of Student Life and Leadership’s dinner and concert. The all-acoustic show featured songs from Radiohead, Armenia folk, Led Zeppelin and an encore that consisted of A-Ha’s Take on Me mixed with Rimsky-Korsokov’s Flight of the Bumblebee. It is inspiring to watch someone who is so good at what they do that they make it seem effortless. Sybarite5 didn’t look like they were playing a concert so much as they looked like they were having a jam session for some of their friends. Sarah Whitney seemed to dance with her violin during Led Zeppelin’s Heartbreaker like she was engaged in a complicatedly beautiful conversation that made her instrument sing. Angela Pickett’s fingers walked across her viol as she made seamless transitions with cellist Laura Metcalf, each plunking her strings at the right time during Sybarite5’s arrangement of Radiohead’s No Surprises. The group was clearly having fun with each other and with the music. Their facial expressions glowed with smiles and concentration and laughter. They used parts of the instruments that I didn’t even know could make music. The percussion section was surprisingly robust for a bunch of stringed instruments. Pickett even borrowed a mechanical pencil from someone in the crowd for Radiohead’s 2+2=5, a song that couldn’t have been played otherwise. Sybarite5 plays music that is experimental, impressionistic and avant-garde, but it is done in such a way that you will still feel comfortable with the sound. And unlike the symphony, Sybarite5’s music will keep you awake with its pulse quickening beat.